Surgical treatment may prevent further ischemic damage to the testis. Rarely, observation is appropriate, depending on the pathology. Diagnosis of testicular torsion is clinical, and diagnostic testing should not delay treatment. Testicular torsion is caused by twisting of the spermatic cord and the blood supply to the testicle (see the image below). With mature attachments, the tunica vaginalis is attached securely to the posterior lateral aspect of the testicle, and, within it, the spermatic cord is not very mobile. 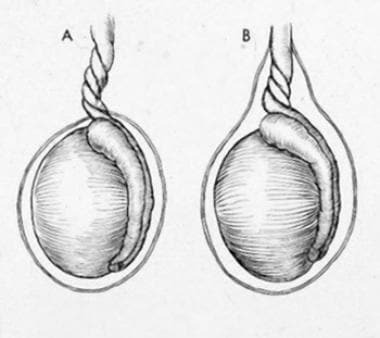 If the attachment of the tunica vaginalis to the testicle is inappropriately high, the spermatic cord can rotate within it, which can lead to intravaginal torsion. This defect is referred to as the bell clapper deformity. This occurs in about 17% of males  and is bilateral in 40%. By contrast, neonates more often have extravaginal torsion. This occurs because the tunica vaginalis is not yet secured to the gubernaculum and, therefore, the spermatic cord, as well as the tunica vaginalis, undergo torsion as a unit. Extravaginal torsion is not associated with bell clapper deformity. This can occur up to months prior to birth and, therefore, is managed differently depending on presentation. Of course, neonates can have intravaginal torsion and this should be managed in the same manner as adolescents. Testicular torsion: (A) extravaginal; (B) intravaginal. For patient education information, see the Men's Health Center, as well as Testicular Pain. For additional information, see Testicular Torsion in Emergency Medicine and Pediatric Testicular Torsion . The testes are paired ovoid structures that are housed in the scrotum and positioned so that the long axis is vertical. The testicle is covered by the tunica vaginalis. Beneath the tunica vaginalis is the capsule of the testis, termed the tunica albuginea. See Male Reproductive Organ Anatomy. The anterolateral two thirds of the organ is free of any scrotal attachment. There is a potential space here, between the tunica vaginalis and the tunica albuginea, where fluid from a variety of sources may accumulate. The tunica vaginalis attaches to the posterolateral surface of the testicle and allows for little mobility of the testicle within the scrotum. The epididymis, connective tissue, and vasculature cover the posterolateral aspect of the organ. For normal development and optimal sperm production, the testis must descend from its original position near the kidney into the scrotum. Researchers propose that various mechanisms, including gubernacular traction and intra-abdominal pressure, are responsible for testicular descent; however, endocrine factors of the hypothalamic-pituitary-testicular axis also play a major role in this process. In neonates, the testicle frequently has not yet descended into the scrotum, where it becomes attached within the tunica vaginalis. This mobility of the testicle predisposes it to torsion (extravaginal testicular torsion). Inadequate fusion of the testicle to the scrotal wall typically is diagnosed within the first 7-10 days of life. In males who have an inappropriately high attachment of the tunica vaginalis, as well as abnormal fixation to the muscle and fascial coverings of the spermatic cord, the testicle can rotate freely on the spermatic cord within the tunica vaginalis (intravaginal testicular torsion). This congenital anomaly, called the bell clapper deformity, can result in the long axis of the testicle being oriented transversely rather than cephalocaudal. This congenital abnormality is present in approximately 12% of males and is bilateral in 40% of cases. The bell clapper deformity allows the testicle to twist spontaneously on the spermatic cord. Torsion occurs as the testicle rotates between 90° and 180°, compromising blood flow to and from the testicle. Complete torsion usually occurs when the testicle twists 360° or more; incomplete or partial torsion occurs with lesser degrees of rotation. The degree of torsion may extend to 720°. The twisting of the testicle causes venous occlusion and engorgement as well as arterial ischemia and infarction of the testicle. The degree of torsion the testicle endures may play a role in the viability of the testicle over time. In addition to the extent of torsion, the duration of torsion prominently influences the rates of both immediate salvage and late testicular atrophy. Testicular salvage is most likely if the duration of torsion is less than 6-8 hours. If 24 hours or more elapse, testicular necrosis develops in most patients. Extravaginal torsion occurs in the fetus or neonate, because the testes may freely rotate prior to the development of testicular fixation via the tunica vaginalis within the scrotum. Normal testicular suspension ensures firm fixation of the epididymal-testicular complex posteriorly and effectively prevents twisting of the spermatic cord. In males with the bell-clapper deformity, torsion can occur because of a lack of fixation, resulting in the testis being freely suspended within the tunica vaginalis. An abnormal mesentery between the testis and its blood supply can predispose it to torsion if the testicle is broader than the mesentery. Contraction of the spermatic muscles shortens the spermatic cord and may initiate testicular torsion. Intravaginal torsion constitutes approximately 16% of cases in patients presenting to an emergency department with acute scrotum. This form of testicular torsion is most often observed in males younger than 30 years, with most aged 12-18 years. Peak incidence occurs at age 13-14 years. The left testis is more frequently involved. Bilateral cases account for 2% of all torsions. Success in the management of spermatic cord torsion is measured by immediate testicular salvage and the incidence of late testicular atrophy. A recent publication documented that approximately 32% of pediatric torsion cases resulted in the orchiectomy. Increased risk was associated with African American race, younger age, and lack of private insurance. The higher association with younger age may be secondary to delay in diagnosis in young children, who may not be able to communicate the symptoms to caregivers. Orchiopexy is not a guarantee against future torsion, though it does reduce the odds of a future torsion. To explain the decreased fertility observed in unilateral torsion of the spermatic cord, several specialists suggest an autoimmune mechanism. This hypothesis is based upon knowledge of the blood-testis barrier, which isolates the luminal compartment of the seminiferous tubule; animal studies in which researchers induced experimental allergic orchitis; and comparison of contralateral testicular disease to sympathetic ophthalmia, a cell-mediated immune response. Ta A, D'Arcy FT, Hoag N, D'Arcy JP, Lawrentschuk N. Testicular torsion and the acute scrotum: current emergency management. Eur J Emerg Med. 2015 Aug 11. 37-41. [Medline]. Barbosa JA, Denes FT, Nguyen HT. Testicular Torsion-Can We Improve the Management of Acute Scrotum?. J Urol. 2016 Jun. 195 (6):1650-1. [Medline]. Acute Scrotum. American Urological Association. Available at https://www.auanet.org/education/acute-scrotum.cfm. July 2016; Accessed: November 22, 2016. Barthold JS. Abnormalities of the Testis and Scrotum and their Surgical Management. McDougal WS, Kavoussi LR, Novick AC, Partin AW, Peters CA, eds. Campbell- Walsh Urology. 10th ed. Philadelphia, PA: WB Saunders; 2012. 642-5. Uguz S, Yilmaz S, Guragac A, Topuz B, Aydur E. Association of Torsion With Testicular Cancer: A Retrospective Study. Clin Genitourin Cancer. 2016 Feb. 14 (1):e55-7. [Medline]. Sauvestre F, André G, Harran MH, Hemard M, Carles D, Pelluard F. Prenatal Testicular Torsion: Not Always in the Late Third Trimester. Urology. 2016 Mar. 89:132-3. [Medline]. Dogra V, Bhatt S. Acute painful scrotum. Radiol Clin North Am. 2004 Mar. 42(2):349-63. [Medline]. Roth CC, Mingin GC, Ortenberg J. Salvage of bilateral asynchronous perinatal testicular torsion. J Urol. 2011 Jun. 185(6 Suppl):2464-8. [Medline]. Kar A, Ozden E, Yakupoglu YK, Kefeli M, Sarikaya S, Yilmaz AF. Experimental unilateral spermatic cord torsion: the effect of polypolymerase enzyme inhibitor on histopathological and biochemical changes in the early and late periods in the ipsilateral and contralateral testicles. Urology. 2010 Aug. 76(2):507.e1-5. [Medline]. Beni-Israel T, Goldman M, Bar Chaim S, Kozer E. Clinical predictors for testicular torsion as seen in the pediatric ED. Am J Emerg Med. 2010 Sep. 28(7):786-9. [Medline]. Cubillos J, Palmer JS, Friedman SC, Freyle J, Lowe FC, Palmer LS. Familial testicular torsion. J Urol. 2011 Jun. 185(6 Suppl):2469-72. [Medline]. Cost NG, Bush NC, Barber TD, Huang R, Baker LA. Pediatric testicular torsion: demographics of national orchiopexy versus orchiectomy rates. J Urol. 2011 Jun. 185(6 Suppl):2459-63. [Medline]. Cattolica EV, Karol JB, Rankin KN, Klein RS. High testicular salvage rate in torsion of the spermatic cord. J Urol. 1982 Jul. 128(1):66-8. [Medline]. Ringdahl E, Teague L. Testicular torsion. Am Fam Physician. 2006 Nov 15. 74(10):1739-43. [Medline]. Sun J, Liu GH, Zhao HT, Shi CR. Long-term influence of prepubertal testicular torsion on spermatogenesis. Urol Int. 2006. 77(3):275-8. [Medline]. Puri P, Barton D, O'Donnell B. Prepubertal testicular torsion: subsequent fertility. J Pediatr Surg. 1985 Dec. 20(6):598-601. [Medline]. Coley BD. The Acute Pediatric Scrotum. Ultrasound Clinics. 2006. 1:485-96. [Full Text]. Yang C Jr, Song B, Liu X, Wei GH, Lin T, He DW. Acute scrotum in children: an 18-year retrospective study. Pediatr Emerg Care. 2011 Apr. 27(4):270-4. [Medline]. Johnston BI, Wiener JS. Intermittent testicular torsion. BJU Int. 2005 May. 95(7):933-4. [Medline]. Hayn MH, Herz DB, Bellinger MF, Schneck FX. Intermittent torsion of the spermatic cord portends an increased risk of acute testicular infarction. J Urol. 2008 Oct. 180(4 Suppl):1729-32. [Medline]. Creagh TA, McDermott TE, McLean PA, Walsh A. Intermittent torsion of the testis. BMJ. 1988 Aug 20-27. 297(6647):525-6. [Medline]. [Full Text]. Schmitz D, Safranek S. Clinical inquiries. How useful is a physical exam in diagnosing testicular torsion?. J Fam Pract. 2009 Aug. 58(8):433-4. [Medline]. Barbosa JA, Tiseo BC, Barayan GA, Rosman BM, Torricelli FC, Passerotti CC, et al. Development and initial validation of a scoring system to diagnose testicular torsion in children. J Urol. 2013 May. 189 (5):1859-64. [Medline]. Sheth KR, Keays M, Grimsby GM, Granberg CF, Menon VS, DaJusta DG, et al. Diagnosing Testicular Torsion before Urological Consultation and Imaging: Validation of the TWIST Score. J Urol. 2016 Jun. 195 (6):1870-6. [Medline]. Doehn C, Fornara P, Kausch I, Büttner H, Friedrich HJ, Jocham D. Value of acute-phase proteins in the differential diagnosis of acute scrotum. Eur Urol. 2001 Feb. 39(2):215-21. [Medline]. Prando D. Torsion of the spermatic cord: the main gray-scale and doppler sonographic signs. Abdom Imaging. 2009 Sep-Oct. 34(5):648-61. [Medline]. Dogra VS, Bhatt S, Rubens DJ. Sonographic Evaluation of Testicular Torsion. Ultrasound Clinics. 2006. 1:55-66. Yagil Y, Naroditsky I, Milhem J, Leiba R, Leiderman M, Badaan S, et al. Role of Doppler ultrasonography in the triage of acute scrotum in the emergency department. J Ultrasound Med. 2010 Jan. 29(1):11-21. [Medline]. Turgut AT, Bhatt S, Dogra VS. Acute Painful Scrotum. Ultrasound Clinics. 2008. 3:93-107. Cassar S, Bhatt S, Paltiel HJ, Dogra VS. Role of spectral Doppler sonography in the evaluation of partial testicular torsion. J Ultrasound Med. 2008 Nov. 27(11):1629-38. [Medline]. Blaivas M, Sierzenski P, Lambert M. Emergency evaluation of patients presenting with acute scrotum using bedside ultrasonography. Acad Emerg Med. 2001 Jan. 8(1):90-3. [Medline]. Bomann JS, Moore C. Bedside ultrasound of a painful testicle: before and after manual detorsion by an emergency physician. Acad Emerg Med. 2009 Apr. 16(4):366. [Medline]. Moschouris H, Stamatiou K, Lampropoulou E, Kalikis D, Matsaidonis D. Imaging of the acute scrotum: is there a place for contrast-enhanced ultrasonography?. Int Braz J Urol. 2009 Nov-Dec. 35(6):692-702; discussion 702-5. [Medline]. Boettcher M, Krebs T, Bergholz R, Wenke K, Aronson D, Reinshagen K. Clinical and sonographic features predict testicular torsion in children: a prospective study. BJU Int. 2013 Dec. 112(8):1201-6. [Medline]. Crawford P, Crop JA. Evaluation of scrotal masses. Am Fam Physician. 2014 May 1. 89(9):723-7. [Medline]. Altinkilic B, Pilatz A, Weidner W. Detection of normal intratesticular perfusion using color coded duplex sonography obviates need for scrotal exploration in patients with suspected testicular torsion. J Urol. 2013 May. 189(5):1853-8. [Medline]. Nason GJ, Tareen F, McLoughlin D, McDowell D, Cianci F, Mortell A. Scrotal exploration for acute scrotal pain: a 10-year experience in two tertiary referral paediatric units. Scand J Urol. 2013 Oct. 47(5):418-22. [Medline]. McDowall J, Adam A, Gerber L, Enyuma COA, Aigbodion SJ, Buchanan S, et al. The ultrasonographic "whirlpool sign" in testicular torsion: valuable tool or waste of valuable time? A systematic review and meta-analysis. Emerg Radiol. 2018 Jun. 25 (3):281-292. [Medline]. Terai A, Yoshimura K, Ichioka K, Ueda N, Utsunomiya N, Kohei N, et al. Dynamic contrast-enhanced subtraction magnetic resonance imaging in diagnostics of testicular torsion. Urology. 2006 Jun. 67(6):1278-82. [Medline]. Burgu B, Aydogdu O, Huang R, Soygur T, Yaman O, Baker L. Pilot Feasibility Study of Transscrotal Near Infrared Spectroscopy in the Evaluation of Adult Acute Scrotum. J Urol. 2013 Jan 29. [Medline]. Ramachandra P, Palazzi KL, Holmes NM, Marietti S. Factors influencing rate of testicular salvage in acute testicular torsion at a tertiary pediatric center. West J Emerg Med. 2015 Jan. 16 (1):190-4. [Medline]. [Full Text]. Sharp VJ, Kieran K, Arlen AM. Testicular torsion: diagnosis, evaluation, and management. Am Fam Physician. 2013 Dec 15. 88(12):835-40. [Medline]. Filho AC, Oliveira Rodrigues R, Riccetto CL, Oliveira PG. Improving Organ Salvage In Testicular Torsion: Comparative Study Between Patients Submitted Or Not To Preoperative Manual Detorsion. J Urol. 2016 Sep 30. [Medline]. Güneş M, Umul M, Çelik AO, Armağan HH, Değirmenci B. A novel approach for manual de-torsion of an atypical (outward) testicular torsion with bedside Doppler ultrasonography guidance. Can Urol Assoc J. 2015 Sep-Oct. 9 (9-10):E676-8. [Medline]. [Full Text]. Ameli M, Hashemi MS, Moghimian M, Shokoohi M. Protective effect of tadalafil and verapamil on testicular function and oxidative stress after torsion/detorsion in adult male rat. Andrologia. 2018 Jun 19. e13068. [Medline]. Ghasemnejad-Berenji M, Ghazi-Khansari M, Pashapour S, Jafari A, Yazdani I, Ghasemnejad-Berenji H, et al. Synergistic effect of rapamycin and metformin against germ cell apoptosis and oxidative stress after testicular torsion/detorsion-induced ischemia/reperfusion in rats. Biomed Pharmacother. 2018 Sep. 105:645-651. [Medline]. Park K, Choi H. An evolution of orchiopexy: historical aspect. Korean J Urol. 2010 Mar. 51(3):155-60. [Medline]. [Full Text]. Dajusta DG, Granberg CF, Villanueva C, Baker LA. Contemporary review of testicular torsion: New concepts, emerging technologies and potential therapeutics. J Pediatr Urol. 2012 Oct 5. [Medline]. [Full Text]. Lian BS, Ong CC, Chiang LW, Rai R, Nah SA. Factors Predicting Testicular Atrophy after Testicular Salvage following Torsion. Eur J Pediatr Surg. 2015 Oct 28. [Medline]. Kozminski DJ, Kraft KH, Bloom DA. Orchiopexy without Transparenchymal Fixation Suturing: A 29-Year Experience. J Urol. 2015 Dec. 194 (6):1743-7. [Medline]. Liang T, Metcalfe P, Sevcik W, Noga M. Retrospective review of diagnosis and treatment in children presenting to the pediatric department with acute scrotum. AJR Am J Roentgenol. 2013 May. 200(5):W444-9. [Medline]. A 17-year-old adolescent boy with a 72-hour history of scrotal pain. Intraoperative findings in testicular torsion. Transverse power Doppler image of both testes illustrates an enlarged, avascular left testicle. Testicular torsion. Transverse color Doppler image of the left groin illustrates an undescended testicle without flow.